Exor Deutschland GmbH will be present at SPS/IPC/DRIVES 2017 in Nuremberg from 28th to 30th November 2017. Hall 9 - Booth 170 and Booth 283. Exor distributor for Norway Autic System AS will be present at Nor Shipping in Oslo from May 30th to June 2nd 2017. Exor International S.p.A., will participate at SPS/IPC/DRIVES ITALY from 23rd to 25th of May 2017, at "Fiere di Parma". JMobile V2.0 Service Pack 1 has been released! JMobile V2.0 has been released! Exor and Nexcom extend Partnership! 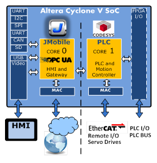 Cloud Enabled PLC+HMI for Industry 4.0: Winner! If you are new to industrial automation with JMobile software, our video tutorials are a great way to get started. They range from basic to more advanced topics, and are best watched in the order that they are listed. Exor International, always sensitive to the environment, found in Multiutility SpA the ideal partner for the production of electricity from renewable sources. Sitek S.p.A. becomes Exor International S.p.A.
Sitek S.p.A. will take the Exor International S.p.A. name by January 1st 2012.